Maryland native Brittaney Logan knows what she wants out of life. Currently, her sole focus is not just competing, but winning her next barrel racing event. 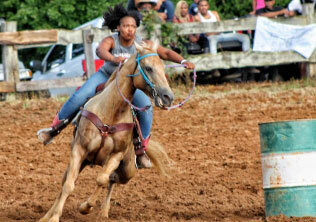 Barrel racing is an exciting sport where the winner can be decided sometimes by the thousandths of a second. More importantly, the delicate relationship between the rider and horse is crucial. The horse’s athleticism, mental condition, and the rider’s horsemanship skills are tested as they deftly maneuver through a cloverleaf pattern at top speed. The course consists of barrels placed in a triangle in the middle of an arena. The rider races into the arena with the timer starting when the team crosses the start line, and ends after completing the clover leaf pattern and racing to cross the finish line. The team that puts up the best time with tight turns, explosiveness, communication and no overturned barrels wins. While barrel racing was initially developed for cowgirls, modern barrel racing is open to men and women of all ages and levels of experience with payouts surpassing $250,000. Brittaney is a proud member of the Cowgirls of Color. You may recall our interview with fellow member Sandra Dorsey in a previous article. Since the team formed a few years ago, they have set out to prove that they’re more than just a novelty team. Someone once said that actions speak louder than words. When one looks at this team’s actions and the obstacles they’ve had to overcome, one can see that they are more than qualified to compete with their male counterparts in the arena. Although Logan may wear a cowgirl hat in the arena, she wears many different hats as an employee for a large insurance company, owner of a successful catering business, and loving mother to a 12 year old son. Andre: How did you end up joining the Cowgirls of Color? Brittaney: I have always been an active person, which has helped smooth my introduction to competition riding. Several years ago, I was on a kickball team with Cowgirls of Color member Kisha “KB” Bowles. When one of the members of Cowgirls of Color was injured and unlikely to return, Bowles recruited me to fill the post. I had some basic riding experience, but NEVER had intentions of competing on any type of professional or semi pro circuit. After a little bit of arm twisting, I decided to give it shot. A month and a half later, I was thrown into my first competition. It was a STEEP learning curve, but the members of the team are now part of my family. Andre: Tell me about your first competition with the Cowgirls of Color. Brittaney: It was pretty rough. I had practiced hard in the weeks leading up to the competition and was feeling pretty confident. When I entered the arena with my horse, everything changed. With the music blasting, large crowds, and the announcers talking through the speakers, my horse was unable to focus and grew more anxious and erratic by the moment. Although I didn’t achieve the result I was looking for that evening, I continued to compete in many local and regional events after that. All of these events allowed me to sharpen my skills and learn more about myself and my horse. Andre: I hear your nickname is BrittBrat. Can you share how you earned that name? Brittaney: I earned my nickname as a child. I know what I want, and won’t settle for anything less. My parent’s spoiled me as a child and as an adult I continue to make sure I don’t allow for second best. Some may consider me a bit of a brat because of this. That uncompromising desire to excel is why I can be a great mother, employee, business owner and still find time to squeeze in practices on weekends and as time permits. Andre: What advice would you give someone interested in competing? Brittaney: Make sure you do this for the love of the horse and not for the money. You have to love the horse first. Don’t get so wrapped up in the business end of things you forget what got you into this in the first place. I consider myself a cowgirl, not an equestrian. In my mind, a cowgirl has a more intimate and hands on relationship with their horse. I’ve gotten to know my horses well over the years and it has made all the difference. 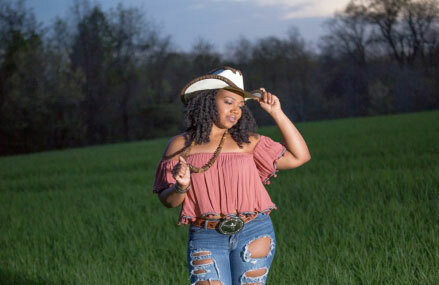 Andre: What’s next for you and the Cowgirls of Color? Brittaney: I can’t reveal much, but BIG things are in the works! Stay posted! Note from the Author: It was an honor to interview Ms. Brittaney Logan and I give her my sincere thanks for making the time to chat with me. Recently, the Cowgirls of Color were featured in multiple commercials with Ford Motor Company. Please visit the links below to watch!